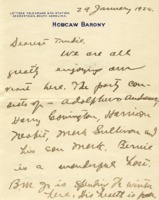 Title is exactly "Cary T. Grayson to Alice Gertrude Gordon Grayson"
Cary Grayson writes to Alice Gordon telling her he wishes she were with him and relaying various details about social engagements. 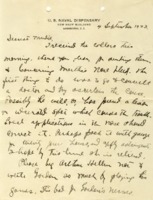 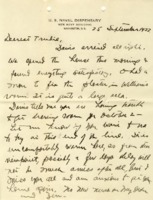 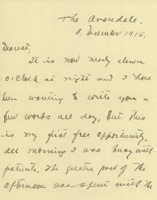 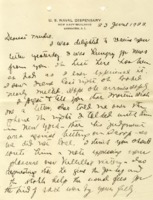 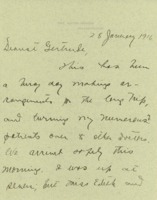 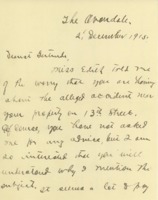 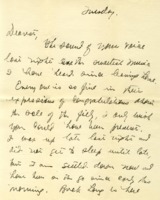 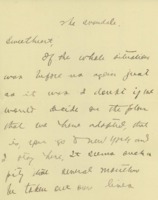 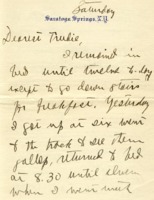 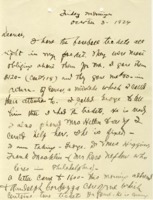 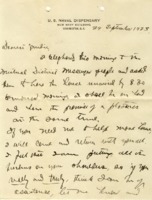 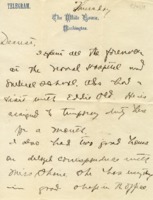 Cary Grayson writes to Alice Gordon Grayson, thanking her for her letter and telling her about treating Nancy Lane’s injured ankle. 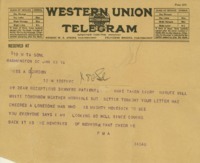 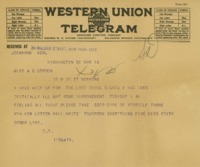 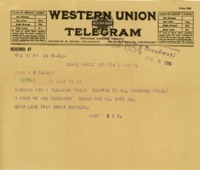 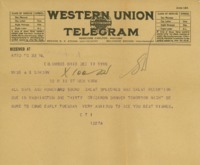 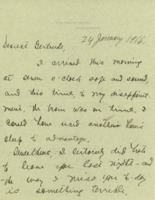 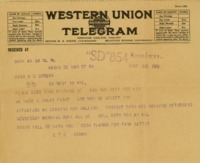 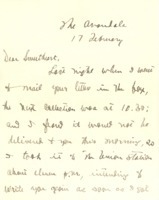 Cary Grayson tells his fiancee that he missed the last mailing of the day as well as the last train, which is why she does not have a second letter from him. 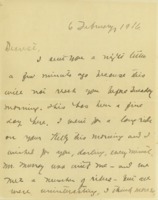 Cary Grayson tells his fiancee that he is looking forward to seeing her the next day and spend two days with her. 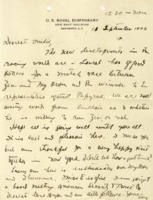 Cary T. Grayson is thrilled to have spoken with Alice Gordon Grayson the previous night, and is also pleased with the sale of a filly. 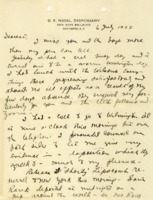 Cary T. Grayson updates Alice Gordon Grayson on what has been happening at home while she is away recovering. 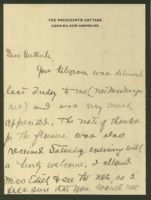 The new furnace is not working well, but they are all in good spirits. 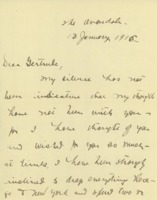 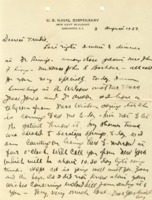 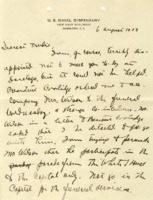 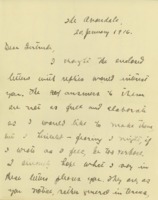 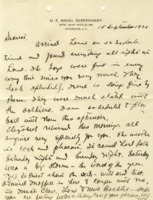 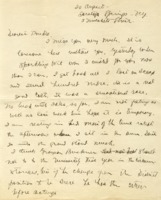 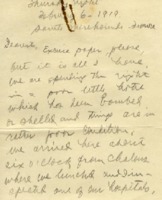 Cary Grayson writes to Alice Gordon Grayson about the change in his travel plans with Stockton Axson and various household matters. 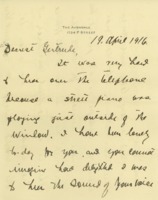 Cary Grayson writes about playing toy soldiers with their sons and sends his love to Alice Gordon Grayson as she is staying at the sea for her health. 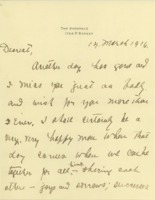 Grayson tells Alice Gordon Grayson that he has returned home safely and looks forward to playing ball with their sons who miss her very much. 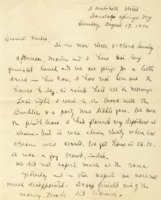 Cary Grayson tells Alice Gordon Grayson that he has arrived safely and has been enjoy hunting, getting plenty of good food and rest, and misses her and their sons. 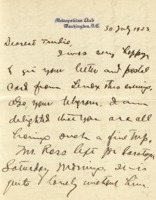 She will be traveling up to meet him soon. 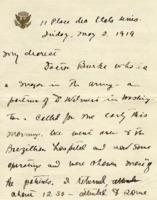 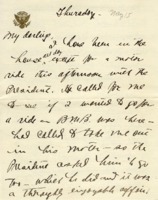 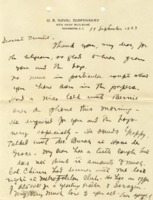 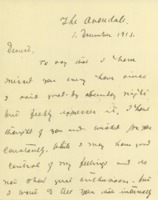 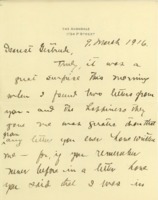 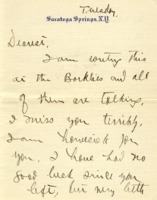 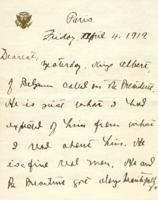 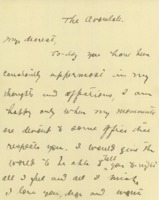 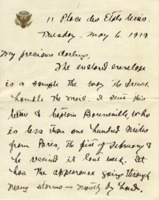 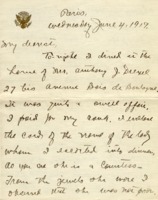 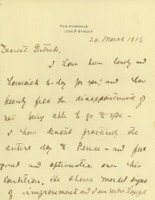 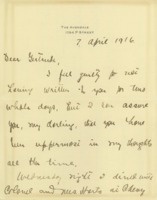 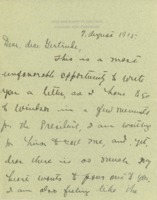 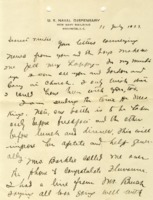 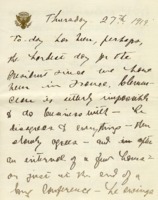 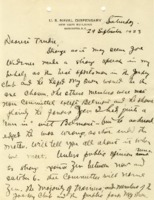 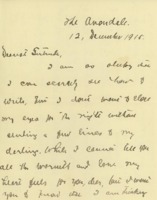 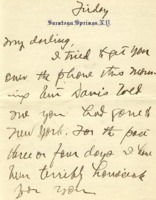 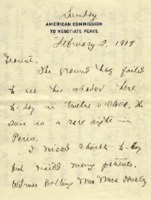 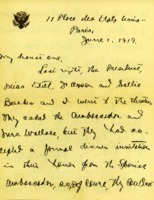 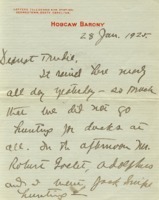 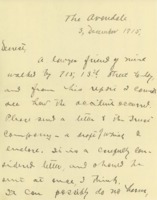 Cary T. Grayson writes to Alice Gordon Grayson in the midst of a busy schedule before leaving on a trip with Bernard Baruch and his guest. 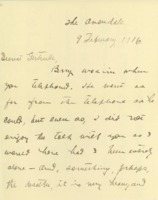 Cary Grayson tells Alice Gordon Grayson that he has arrived safely despite the flooding that will probably make duck hunting poor. 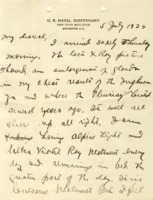 He hopes they have arrived safely at their destination. 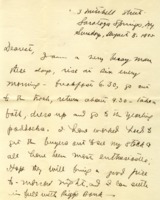 Cary Grayson writes to his wife, Alice Gordon Grayson, about his restful visit to the races at Saratoga where he has won a little money. 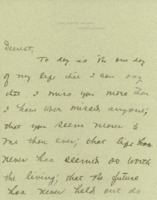 He sends his love to her and their boys. 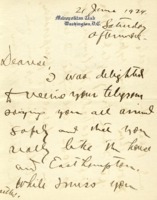 Cary T. Grayson updates Alice Gordon Grayson on conditions at home while she is traveling. 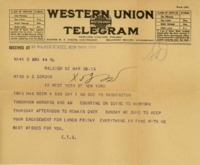 Cary T. Grayson tells Alice Gordon Grayson that he has arrived safely and has purchased a box for an upcoming ballgame. 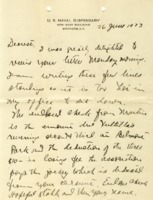 Cary T. Grayson writes to Alice Gordon Grayson about housing and repairs, letters from their sons, and horse racing. 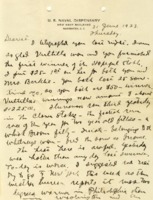 Cary T. Grayson writes to Alice Gordon Grayson about household details, an upcoming horse race, and his social activities. 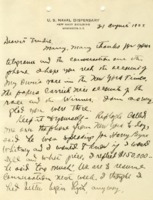 Cary T. Grayson writes to Alice Gordon Grayson about their horse winning the Saratoga Cup and family finances. 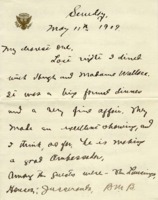 He comments on his work with Wilson and mention’s Edith Bolling Wilson’s trip to Massachussetts. 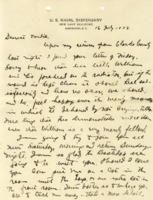 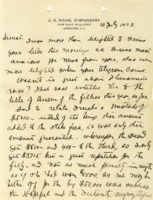 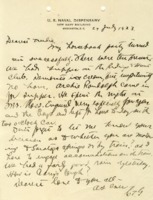 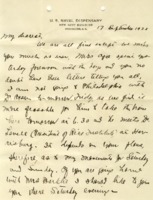 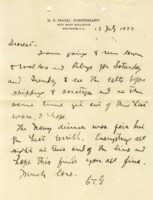 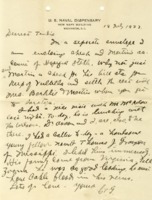 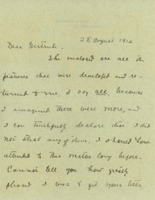 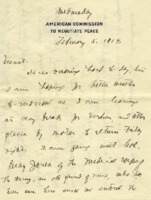 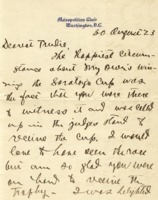 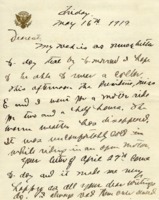 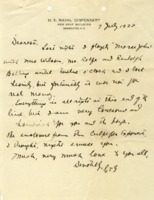 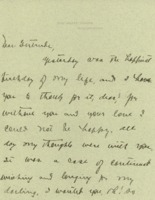 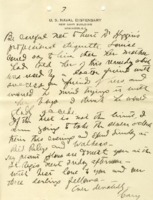 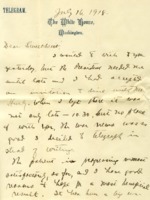 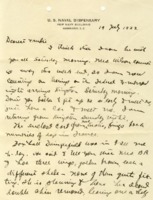 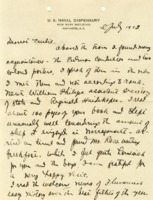 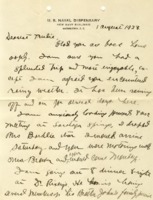 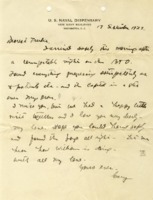 Cary Grayson writes to his wife, Alice Gordon Grayson, about their travel plans to Saratoga, his social interactions in Washington, and family finances. 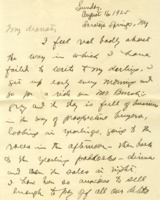 Cary T. Grayson tells Alice Gordon Grayson about his ride and dinner at the hunt club and their travel plans to Saratoga Springs. 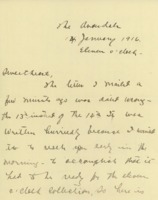 Cary Grayson writes to his wife as he is on the train after visiting with the family. 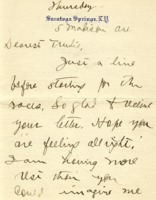 Cary Grayson relates various social details to Alice Gordon Grayson including the impending plastic surgery of Mr. BBJ. 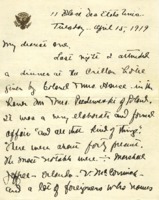 Cary Grayson tells Alice Gordon Grayson about a farewell dinner for General Neville at the Alfalfa Club and other events that made a busy week for him. 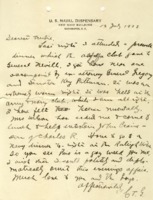 Cary T. Grayson tells Alice Gordon Grayson about attending the races with President and Mrs. Wilson and sitting next to a British barrister at dinner who did not appreciate his jokes. 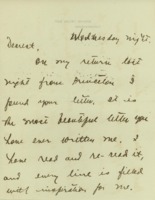 He tells her he misses and loves her. 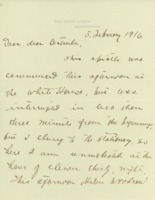 Dr. Grayson writes to his wife relating his activities of the day including playing golf with the President and attending the theater. 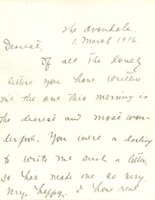 He closes with expressions of love for her. 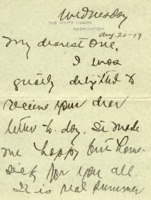 Cary T. Grayson writes of the heat in Washington and his hopes to spend a few days with Alice Gordon Grayson and their sons. 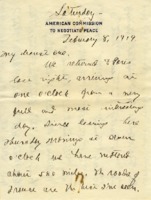 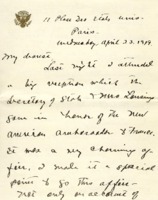 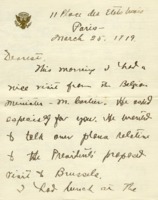 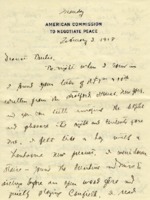 Cary T. Grayson writes to Alice Gordon Grayson about conditions in Paris immediately preceding the signing of the Treaty of Versailles. 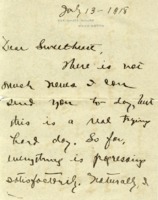 Cary T. Grayson writes to his fiancée, Alice Gordon Grayson about weekend and wedding plans. 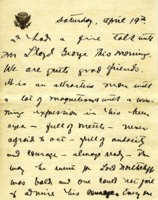 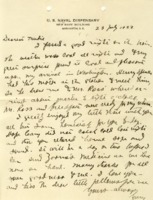 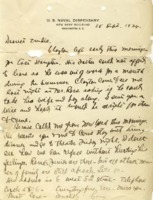 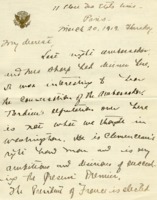 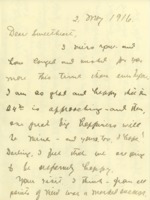 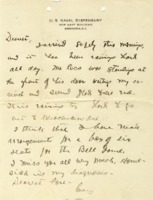 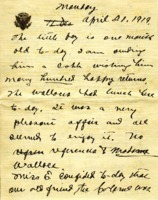 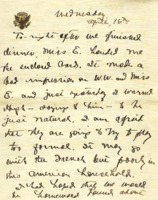 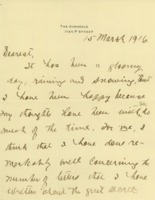 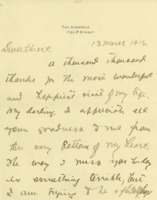 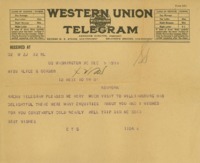 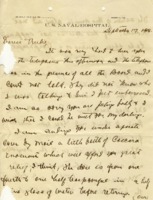 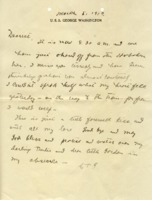 Cary T. Grayson sends a letter to his fiancée, Alice Gordon Grayson. 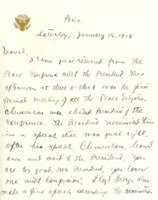 Cary T. Grayson describes the excitement generated by President Woodrow Wilson’s message to Germany. 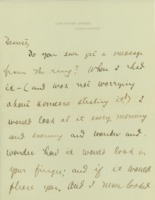 Cary T. Grayson discusses their engagement with Alice Gertrude Gordon. 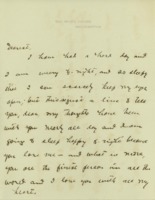 Cary Grayson tells his fiancee of Thomas Pence’s death. 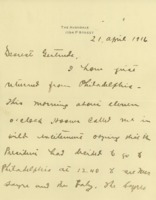 Cary T. Grayson briefly describes a trip with President Woodrow Wilson to a Philadelphia occulist to his fiancée, Alice Gertrude Gordon. 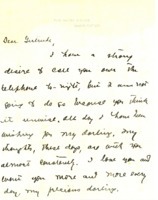 Cary T. Grayson describes sharing news of their engagement to his fiancée, Alice Gertrude Gordon. 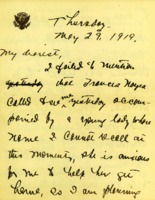 Cary T. Grayson describes his social calls and his efforts to treat his patient, Thomas J. Pence, to his fiancée, Alice Gertrude Gordon. 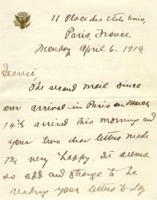 Cary Grayson wishes his fiancee pleasant travels to see the Cournerse family. 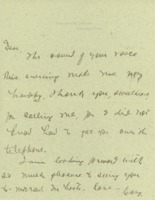 Cary Grayson wires his fiancee that he will telephone her when he arrives at the station. 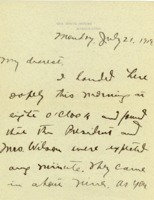 Cary T. Grayson discusses President Woodrow Wilson’s plans for a Western speaking tour and personal matters related to their engagement with his fiancée, Alice Gertrude Gordon. 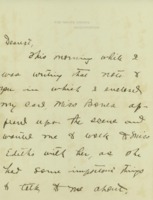 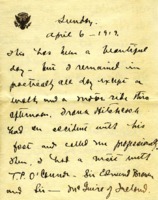 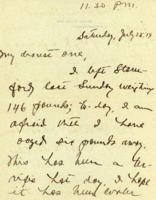 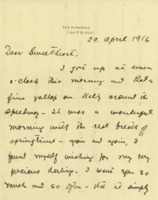 Cary T. Grayson writes to his fiancée, Alice Gertrude Gordon, about his daily activities. 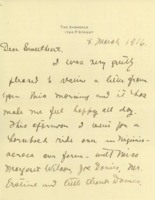 He remarks on seeing Woodrow and Edith Wilson on their return from their honeymoon. 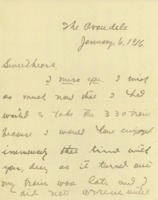 Cary Grayson writes to his fiancee about their plans to be apart for the next few months, and his travel plans to visit her. 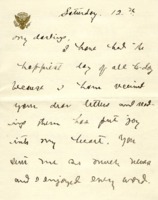 Cary T. Grayson writes about his hopes for the future to his fiancée, Alice Gertrude Gordon. 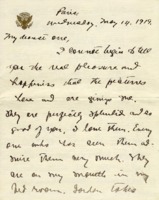 Cary T. Grayson comments on President Woodrow Wilson’s reaction to his engagement in this letter to his future wife, Alice Gertrude Gordon. 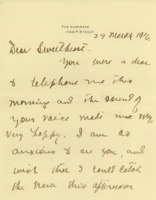 Cary T. Grayson breaks an appointment with his future wife, Alice Gertrude Gordon. 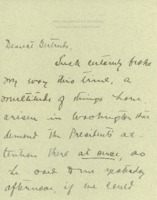 Cary T. Grayson mentions that President Woodrow Wilson has an appointment with an occulist; he discusses his efforts to cure Thomas J. Pence with his fiancée, Alice Gertrude Gordon, as well as plans for announcing their engagement. 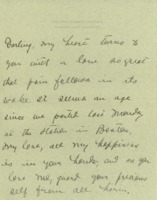 Cary T. Grayson writes to his fiancée, Alice Gordon Grayson about wedding announcement cards and plans to meet. 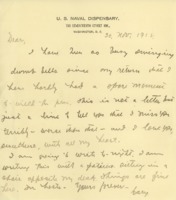 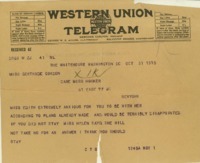 Cary T. Grayson mentions attending President Woodrow Wilson’s address to Congress on Germany’s use of unrestricted submarine warfare in a letter to his fiancée, Alice Gertrude Gordon. 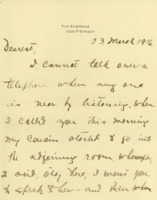 Cary Grayson cables Alice Gordon Grayson wishing he could fully express how much he missed her. 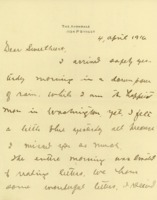 Cary T. Grayson describes his social life and activities in Washington, DC to his fiancée, Alice Gertrude Gordon. 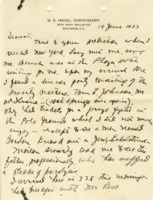 Cary T. Grayson describes reactions to the announcement of his engagement to Alice Gertrude Gordon; mentions that Edith Bolling Wilson is sitting for her portrait. 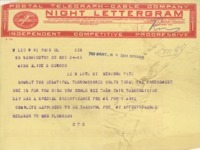 Cary Grayson is due in at nine and looking forward to seeing his fiancee. 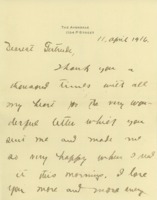 Cary T. Grayson discusses plans to meet with his fiancée, Alice Gertrude Gordon. 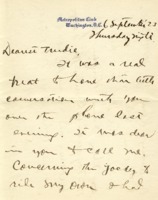 Cary T. Grayson describes his social and professional activities to his fiancée, Alice Gertrude Gordon. 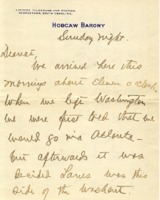 Cary T. Grayson describes President Woodrow Wilson’s troubles over Mexico to his fiancée, Alice Gertrude Gordon. 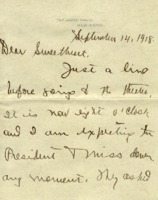 Cary T. Grayson describes President Woodrow Wilson’s speaking tour across the mid-West and the appointment of Louis D. Brandeis to the Supreme Court. 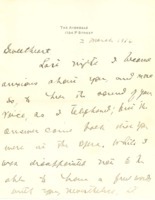 Cary T. Grayson reports on President Woodrow Wilson’s speaking tour to his fiancée, Alice Gertrude Gordon. 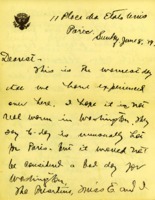 Cary T. Grayson describes President Woodrow Wilson’s travel plans with his fiancée, Alice Gertrude Gordon. 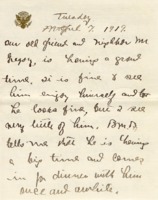 Cary Grayson writes his fiancee that the he will be late due to the train. 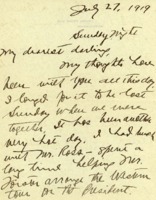 Cary Grayson tells Alice Gordon Grayson that while his schedule has kept him from writing, the memories of being with her in New York cheer him. 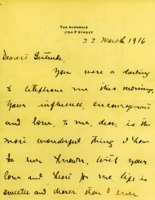 Cary T. Grayson discusses plans for the wedding with his fiancée, Alice Gertrude Gordon. 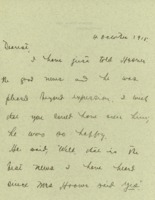 Cary Grayson tells his fiance that he enjoyed the visit to Williamsburg, and that he misses her. 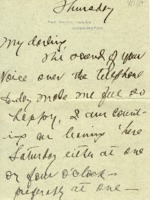 Cary Grayson thanks his fiancee for calling him that evening. 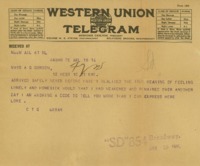 Cary Grayson tells his fiancee he has bought two thoroughbred colts. 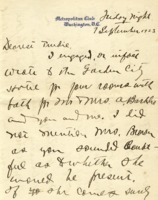 Cary T. Grayson conveys to his fiancée, Alice Gertrude Gordon, Edith Bolling Wilson’s desire to have her visit. 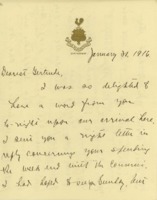 Cary T. Grayson describes social life and entertainment at the White House to his future wife, Alice Gertrude Gordon. 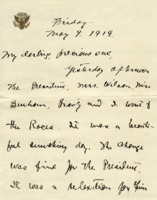 Cary T. Grayson comments on negative public reaction President Woodrow Wilson’s announcement of his engagement to Edith Bolling Wilson. 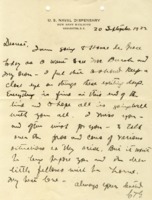 Cary T. Grayson comments on the potential for war with Germany in this letter to his future wife, Alice Gertrude Gordon. 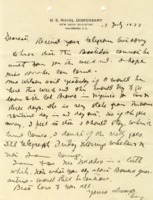 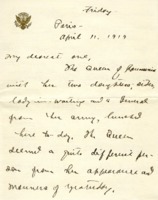 Cary T. Grayson outlines President Woodrow Wilson’s travel plans in a letter to his future wife, Alice Gertrude Gordon. 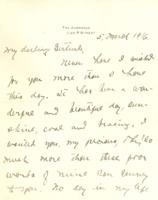 Cary Grayson writes of his love to his fiancee Alice Gordon Grayson and his pleasure at her phone call and letter.